To date the UK has received c. 8000 Syrian refugees through its Syrian Vulnerable Person resettlement programme towards the quota of 20,000 by 2020 set by the government. Vulnerable Syrian families attempting to adjust to life and culture in a different country after the loss of home, livelihood, possessions and community in their country of origin and much other hardship besides, face a level of challenge which is unimaginable to most of us. Resettlement programmes prioritise providing support for housing, finding work and learning English. The latter is a vital step in the process of resettlement. Unfortunately, not all adult refugees are able to start English classes when they arrive in the UK; some are having to wait a long time, even several years, before being able to start learning English. These problems are not confined to Syrian refugees but are commonly experienced by all refugees in various parts of the UK. ESOL courses delivered by Further Education colleges and by charities and partnerships supported by funding through local councils, the EU and the lottery are typical means of providing English language support. However, there are waiting lists for class places in some parts of the country. Increasingly, volunteers are coming forward to help deliver free classes. These volunteers include very experienced teachers with an armful of qualifications as well as individuals new to teaching, to ESOL or to teaching refugees. A problem commonly faced is the lack of suitable course books for teaching refugees since most publications are designed for an EFL market and are far too Euro-centric in approach, especially for students with no, or very little, English. Where possible, the best approach is to design or evolve a tailor-made course for students following an initial language assessment and needs analysis. Then a ‘mix and match’ approach can be adopted using volunteer-created materials, which include realia and authentic material from everyday life, and mixing these with carefully-selected teaching materials freely available on the internet. A Google search will throw up lots of websites hosting or sharing free teaching ideas, activities and downloadable practice exercises for all aspects of standard EFL. However, there are also websites which cater more for the circumstances that refugees find themselves in, providing contextually relevant material and an introduction to practical aspects of living in the UK and so-called ‘Skills for Life’. One example is the Excellence Gateway ESOL page. This site is a bit challenging to navigate around but there are some useful resources here. Users need to create an account. 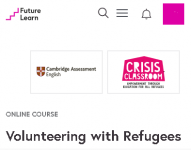 For prospective or new volunteers, or teachers wishing to understand more about volunteering with refugees there are several free and open courses (MOOCs) online. See for example Volunteering with refugees. This MOOC is due to run again from 15 January 2018 or you can sign up to join a later course. The Crisis Classroom website also offers some useful background for volunteers. Next month’s blogpost will consider the situation of Syrian students aiming to study in Higher Education in the UK and the resources that are available to help them with this. Should I employ an English tutor to help with my university studies? It is becoming increasingly common for international students to hire a private tutor to help them with their studies at British universities. But what are the advantages of this, and are there any pitfalls? Most universities these days provide very good additional support for students in all areas of academic life. Courses are generally offered in how to develop academic English and your communication skills for the academic environment. Other courses may be offered in further study skills such as critical thinking, presentation skills, revision skills and exam technique. If you do not think that the support you can access is adequate for your needs, you should discuss this with your supervisor or tutor. If you are concerned that your written English may contain grammatical mistakes, then your supervisor may suggest that you employ a proofreader to help you check your work. It may not be appropriate in all circumstances, and so you should check with your supervisor beforehand. The role of a proofreader is to identify and correct errors in your written work, and it is likely that you would have to pay for this yourself. Be very clear that a proofreader must not substantially change the meaning or content of a piece of work. For example, they must not correct factual errors or rewrite your work to improve the arguments you make, or re-arrange paragraphs to improve the structure of your work. If you ask someone else to write something for you, or if someone makes substantial changes to your work, this is classed as plagiarism. Other forms of plagiarism include copying another student’s work or including a quote from a book or website without referencing your source or using quotation marks. Universities take plagiarism extremely seriously because the point of university study is to develop the ability to think for yourself. There are serious consequences if you are caught plagiarising, ranging from the loss of marks to being expelled from the university. 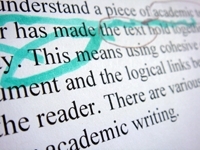 In recent years, there has been an increasing issue of students purchasing essays, often online, to submit as their own work. Companies which provide this service are called ‘essay mills’, and the UK university exams regulator has recently asked the government to introduce laws to ban such services altogether. What about employing a tutor? Employing a tutor is entirely different to plagiarising. Tutors will typically offer a range of services. These will include proofreading as mentioned above, but also other guidance which will improve your academic writing overall. A tutor can help you with such areas as expanding your vocabulary, structuring an essay, developing a convincing argument or improving sentence structure. You can sometimes find a tutor or proofreader through your university. Other ways to find a tutor include searching for a local or national tuition agency. Finally, a tutor directory – where tutors advertise their services – is another straightforward means to find a tutor suited to your needs.